Today I thought I could offer a few more details on my Quartz countertops, as they have become one of my most FAQ on the kitchen remodel! I totally understand why; trying to decide on countertops is a stressful experience. Perhaps sharing our own decision making process will help alleviate your concerns or give you some new ideas, now or down the road! Early on in our design process, we considered all the possibilities for our countertops. Everything from wood (which we used in our English Tudor) to marble to quartz to concrete to a mix of materials. Because our kitchen is bright and VERY sunny at certain times of the day, we ruled out wood since we worried it would potentially fade or crack as well as feel too dark for our space. Concrete was out once we decided on concrete looking floors. We also decided against a mix of materials. Because it’s such a small kitchen, we felt like a streamlined look of consistent counters would look the best. I happen to LOVE marble countertops. I had them in a bathroom in one of our homes and thought they were so beautiful! But it is true what they say, they are sensitive. We had a little friend visiting our house one time and he set a red popsicle on our counters. We never forgot that visit because forevermore our counter had an etched and pink stain to help us remember it! Honestly, those marks never bothered me. I think marble is beautiful as it ages. But not everyone has the same tolerance, so it’s really a personal decision. Even this time we considered marble countertops again, but my husband let me know he really wanted quartz. He has stained our marble baking slabs by setting beets on them, so I understand his concern. :) He loves to cook but he really didn’t want to feel like he had to be cautious about beets or foods that could etch when cooking. I like to limit our household stress levels, ha, so we agreed to stick with quartz. We had quartz counters in our last home’s kitchen and they were pretty awesome, so I really didn’t have any reservations. It is a super strong composite stone material and can be so lovely, too. The quartz we had in our old house was Caesarstone Organic White. 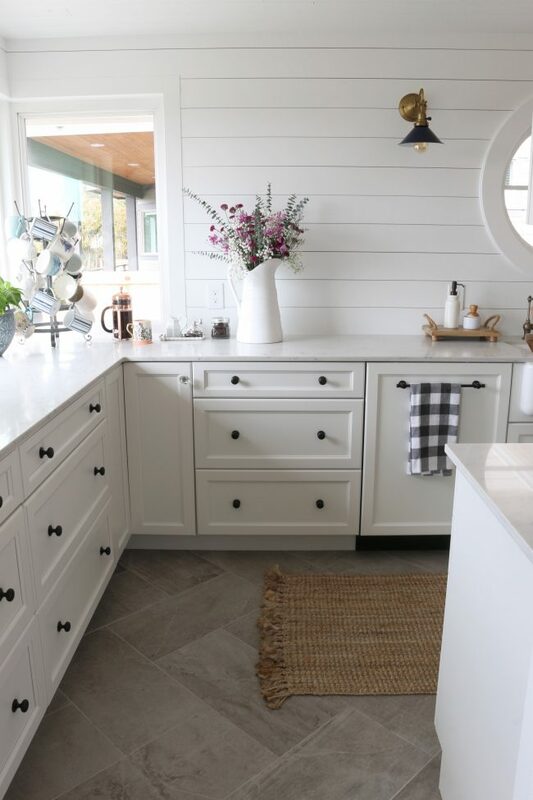 We had tried to avoid any obvious swirly pattern on our counters in that house because our hickory wood floors already had a lot of “movement” and a rustic vibe to them. We didn’t feel our counters should compete, so anything with a marble look felt wrong. But this house, I was excited to look for a marble alternative. Our floors are a porcelain tile that looks like concrete, so I was excited about the contrast between the look of the counters and the concrete. The other piece of the puzzle was that we needed a 2cm quartz in order to fit under our windows. 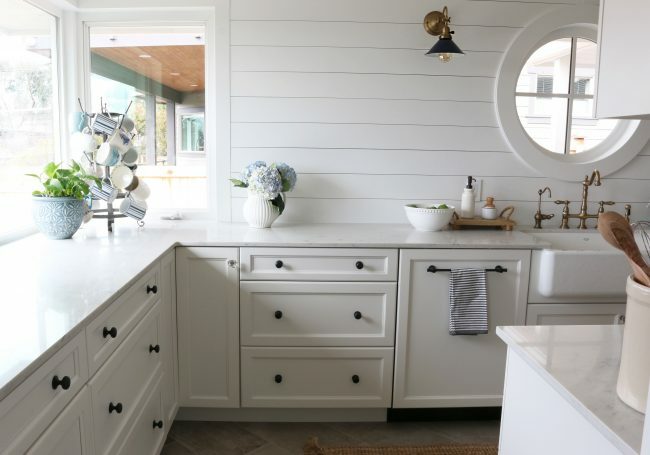 The best way to get the counters to fit and have a seamless look was to have a thinner countertop (rather than needing to cut down cabinets to a less than standard height). For years I had preferred the look of thicker marble countertops, so I wasn’t too sure I was going to be happy with thinner. But after lots of research, I decided that I was actually going to love the look of the 2cm in our home! YAY! But I still couldn’t find a marble-looking quartz that I liked. We just about gave up when our contractor suggested we try Carrara Gioia Quartz at Daltile. I had no idea that Daltile had quartz, but we ran over to their warehouse to take a look. Not only did we love it, but the 2cm was going to be in stock so we didn’t have to wait and could select our favorite slabs. 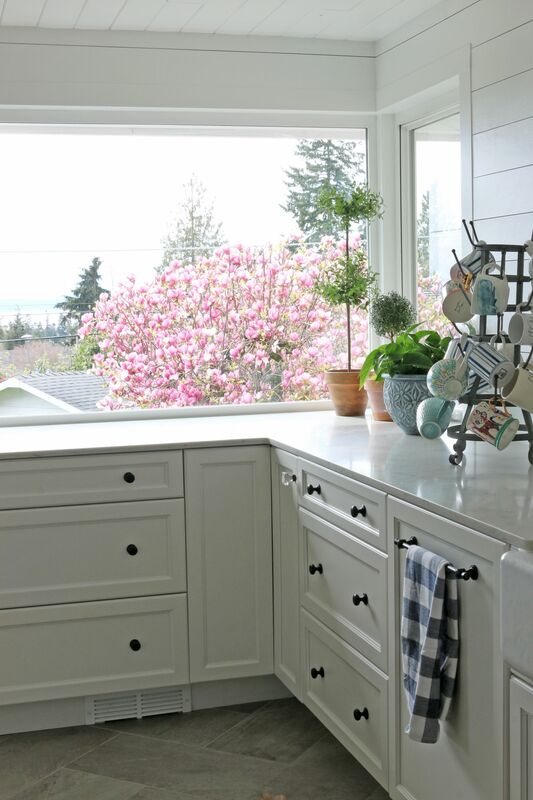 I dreamed of my countertops not only fitting seamlessly under the window, but also of a long expanse of uninterrupted counter space all the way around the corner of the kitchen. It is not a big kitchen, but I think the seamless look of uninterrupted counters help the space to feel larger and be so much more functional. We’ve lived with our new Quartz counters for five months now and still love them! They are super easy to clean and take care of, too (we use Thieves cleaner on them for those who are curious)! Are you looking for new countertops? Love your kitchen. I have marble and really love it but it has it’s drawbacks. 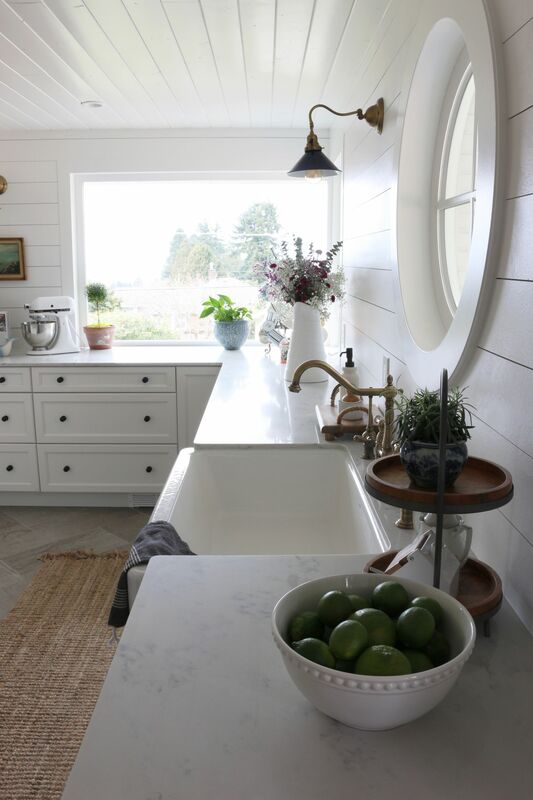 Your countertops are a great alternative and I’m so jelly over your huge windows in there :). In my recent bathroom remodel, I went with quartz and have loved it since the minute it was installed. I LOVE hearing your thought process here! We’re moving to a house in need of a kitchen reno. I’ve been ruminating over similar thoughts. This was very helpful. Thanks Melissa! The price of marble actually depends on where you live (and the type of marble you are looking at), so it’s hard to say! I like the look of the quartz, and the durability of it! 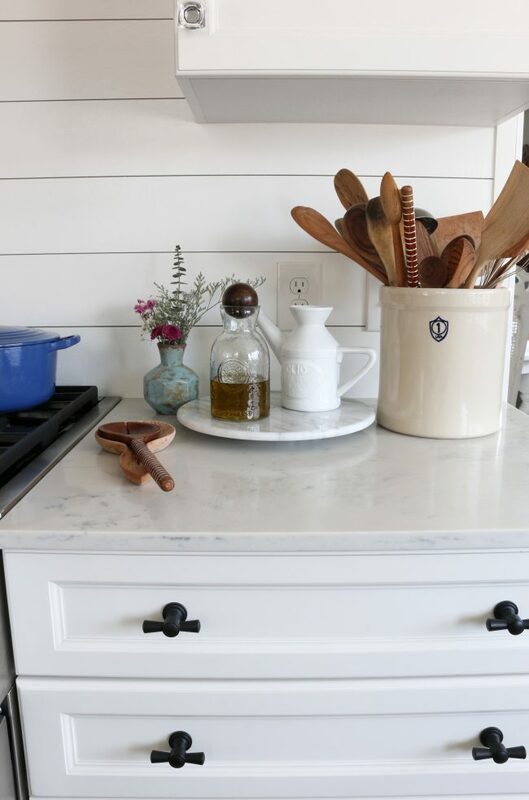 When I change my countertops, if I don’t go with butcherblock, then I’d do quartz! Thank you for information and your thought processes. I want to know about your sink. I’ve only had stainless. But we will be moving soon and I would like your info on the care of your sink. Do you place a plastic guard in it to keep it from marking up? We do actually a metal dish grate (not sure what it’s called) that fits inside. We use it sometimes, it definitely helps keep stuff off the bottom of the sink! It isn’t absolutely necessary, though, the sink is strong and easy to clean up! Your counters are beautiful! I’ve been wanting to do white or marble look quartz counters too but the are so expensive!! We have black granite tiles. I hate the grout lines even though they are thin, just never feel like they are really clean. Anyway, I assume there is a seam at the corner and was wondering if you are able to see or feel it? 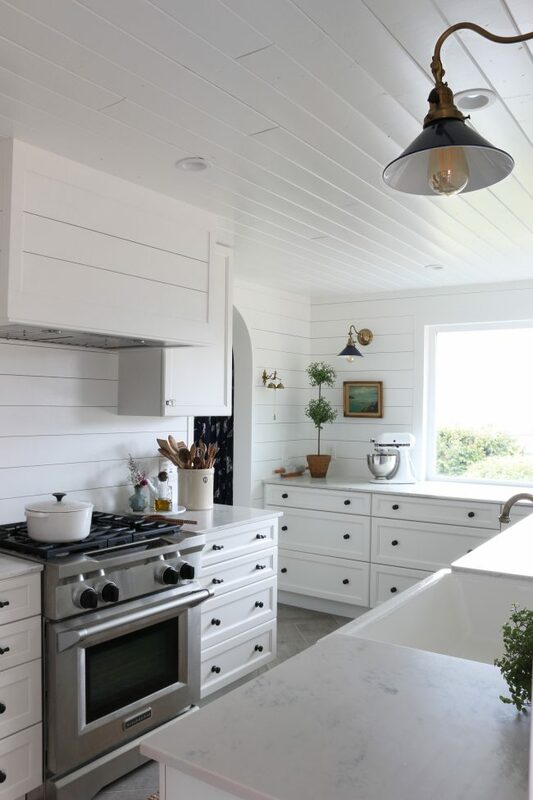 Love your entire kitchen remodel. I love your counters. I wondered if you are able to see the seam. I also recently had marble-looking quartz installed in my kitchen but was surprised at how noticeable the seam was. I asked the installer about it, but they just said because of the light color the seam would be more noticeable than dark counters. Will you please share the details of your floor tile? Love the look of concrete with the ease of porcelain tile. Your kitchen looks absolutely beautiful. I love all the choices you made. I had a client who chose a granite marble alternative for some built-ins with a wet bar and we had a similar problem that required the thinner slab but I had the fabricator added a bull-nose edge to give the counters a thicker appearance. Could you tell me what the finish was on your counter top? ie, polished, honed.. Thank you! Melissa I recently got the same Daltile Gioia quartz countertops. I am a little nuts about them because I am paranoid about staining and scratching, eventhough they say they are so durable. it might be because we are coming from a darker speckled granite where you couldn’t see any mark regardless and now going to white is such a difference. Anyway I am just wondering if you noticed any slight yellowing at your seams. I have a small seam at my cooktop and then a small seam at the sink. They did a great job on them except i feel like one at the sink is slightly looking yellow or my eyes are playing tricks on me. People would say I’m nuts but I just want to keep them looking fresh and clean. My counters are only 2 weeks old so I am just wondering if you’ve had any issues? 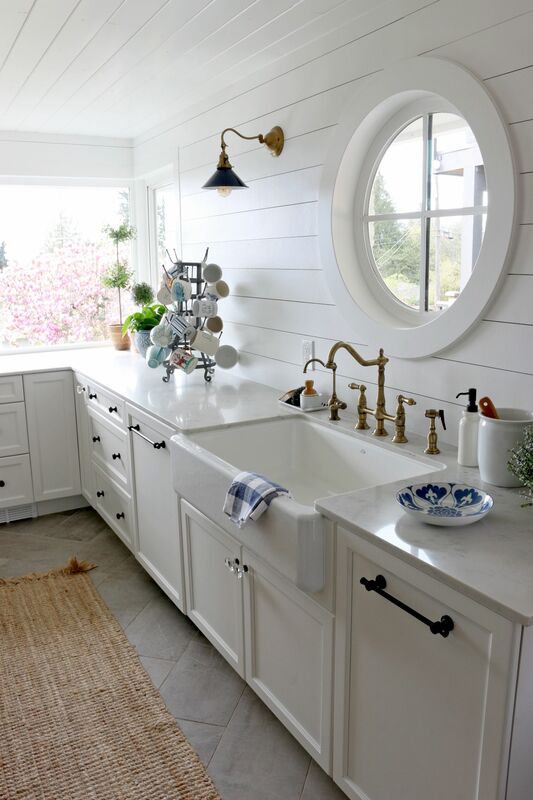 Love the finish and style of your bridge faucet. Can you share the brand and finish? 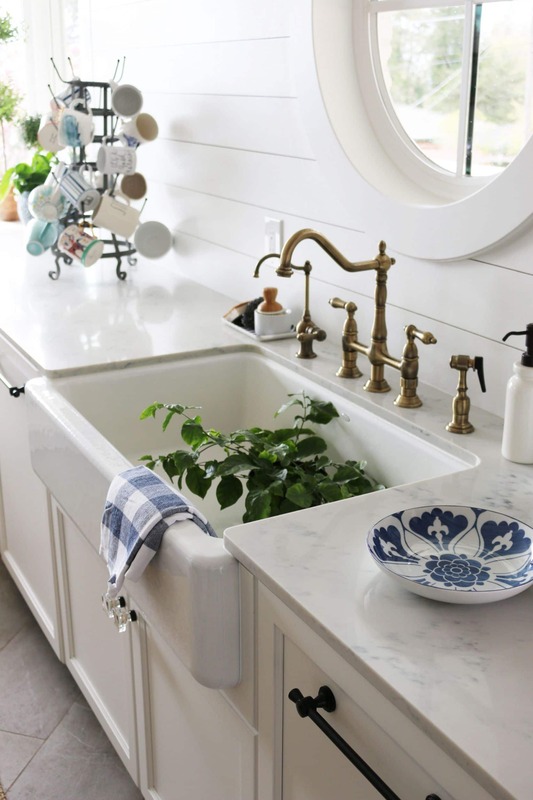 Love your farmhouse sink as well. Can you tell us if its cast iron/fireclay and who makes it? 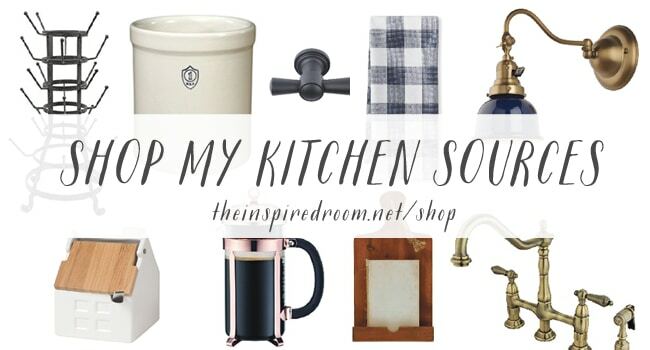 Thank You for posting your beautiful kitchen. I am in the process of building and your pics and information are incredibly helpful. Do you remember apr how much you had to pay for the countertops per sq foot? Hey Melissa, I really love the industrial look of the concrete tiles, but I like that they’re porcelain even more! Could you share what you used for tiles? Thank you so much for sharing your counter tops with the world. I’m working a kitchen remodel and while I was at Daltile today they suggested this Carrera Gioia! I googled them and found your blog! I am now even MORE excited about them!!! Thank you! Just wondering how your faucet in your kitchen sink is holding up. I love this look and have been scouring the internet for big name brands but none really carry this style and color combo. I never heard of Kingston but love the look. Thanks so much for the input. Building our dream home and so overwhelmed! !